If you’re considering moving to Washington DC, you’re not alone. More than 13,000 people move to the United States Capital every year, and many of those are millennials. In fact, according to a study by WalletHub, DC is the best place for millennials to live in America, based on factors including affordability, quality of life, civic engagement levels and economic health. With such a high influx of new residents, competition for housing in top Washington DC neighborhoods is fierce. So it’s more important than ever to learn about the communities in the city and find the ones that suit your style. To help, we’ve created this guide to four of our favorite Washington DC neighborhoods for millennials: DuPont Circle, Capitol Hill, Adams Morgan, and the Navy Yard. It’s Perfect For: Urbanites and well-to-do Washington DC young professionals. This Washington DC neighborhood is one of the most sought-after communities in the city because of its central location and high walkability. The high cost of living is balanced by a short commute, your choice of restaurants and cafes in walking distance, and a high ranking in Washington DC neighborhood safety. 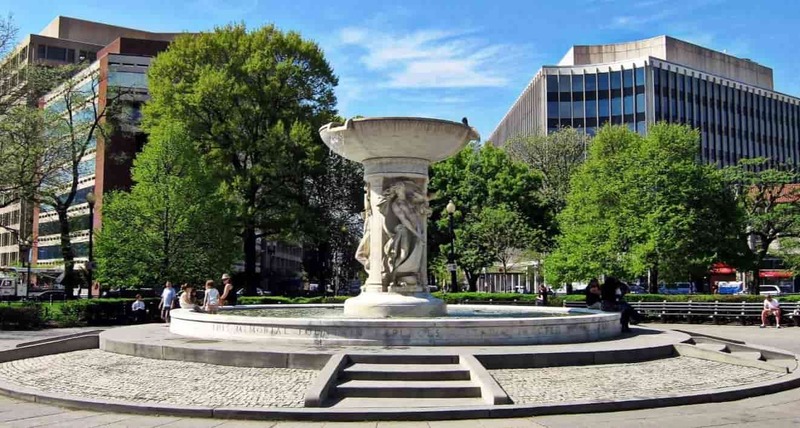 Things to do in DuPont Circle: DuPont Circle is just north of Downtown, making it easy to visit top DC attractions all around the city. In the neighborhood itself, you’ll find some of the best Washington DC places to eat. Enjoy upscale Mediterranean cuisine at the Iron Grille, or satisfy your sweet tooth at Un je ne sais Quoi bakery. DuPont Circle is also home to Embassy Row, The Phillips Collection, and several historic houses, which have been converted to museums. On Connecticut Avenue, you’ll find plenty of shopping opportunities from large brands like H&M to local boutiques like the Tiny Jewel Box. It’s Perfect For: Washington DC millennials, established professionals and aspiring politicians. This neighborhood is known for its high level of diversity and proximity to DC’s major political institutions. There is a mix of housing here, making it one of the best places to live in Washington DC for anyone who wants to be close to the action on Pennsylvania Avenue. Things to do in Capitol Hill: Capitol Hill is conveniently located near the top places to visit in Washington DC, especially if you want to learn more about American history and democracy. Take a trip to the Capitol itself, where you can even see lawmakers in action on the Congress floor. Or, get educated at the Library of Congress, which is the largest library in the World. If you need a break from your studies, visit the U.S. Botanic Gardens to see exotic plant life, or grab a bite to eat at one of the many restaurants on Barracks Row. It’s Perfect For: Millennials, singles and other renters. 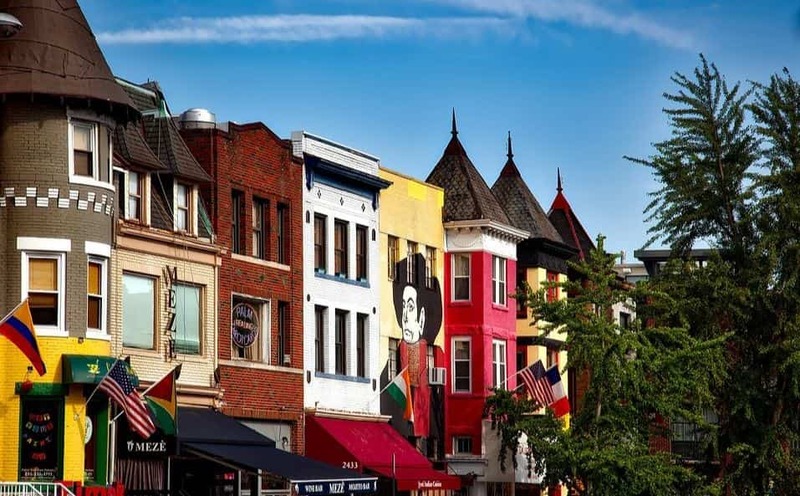 Adams Morgan is the hippest community in our Washington DC neighborhoods guide. It’s highly diverse, with a range of amenities within walking distance. Plus, the lower median rent means Washington DC millennials in the workplace will find this neighborhood affordable when compared to other parts of the city. Things to do in Adams Morgan: Adams Morgan is one of the best Washington DC neighborhoods to visit if you love trying new foods. The area is home to every type of cuisine, from Japanese rice bowls at Donburi to freshly made Falafel at Mama Ayesha’s. 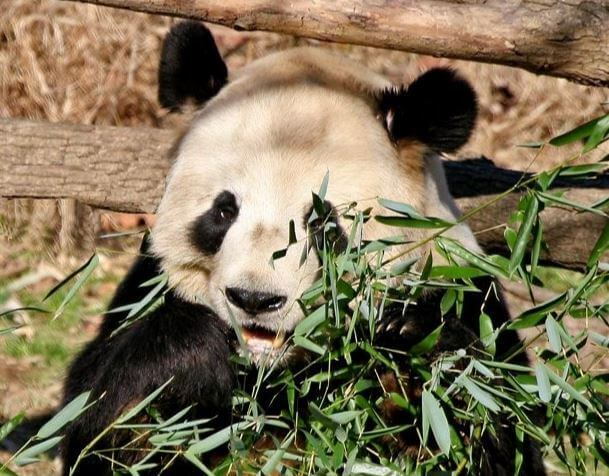 It’s also less than a mile from the Smithsonian National Zoological Park, where you can get up close and personal with over 2,700 animals across 390 species. The best part? The Zoo is 100% free. It’s Perfect For: 20- and thirty-somethings, singles, and young couples. This area of DC is constantly growing and evolving due to local revitalization efforts. It offers apartments with waterfront views and easy access to the rest of the city for Washington DC millennials in the workplace. Despite the high median rent, there are still affordable accommodations in this community, so don’t overlook the Navy Yard if you’re trying to find cheap places to live near Washington DC. Things to do in Adams Morgan: Even though Adams Morgan is a smaller Washington DC neighborhood, that doesn’t mean it’s lacking in fun things to do! Throughout the community, you can find hidden gems, like Idle Time Books, an independent bookstore that’s been catering to locals since 1981. If you need some caffeine to keep your day going, Tryst Coffee offers artisan brews along with cafe fare, along with plenty of seating for freelancers and their laptops. The active nightlife here includes tons of restaurants, rooftop bars, and of course, karaoke. To top your night off, stop by Madam’s Organ to enjoy pub food and a drink while listening to live music. Should You Move to Washington DC? If you want to be at the center of American politics, want to get involved with social activism, or simply want to be part of a vibrant city community, moving to Washington DC is the right choice for you. And remember, the neighborhoods we discussed are only a fraction of the communities available in this city, so make sure to explore them all to find your new hometown! Need to find the best moving companies in Washington DC? Move Matcher lets you find and compare top-rated companies so you can find the movers that best fit your needs. Want to explore more of the best neighborhoods for millennials by city? Check out our neighborhood guides for Detroit, Las Vegas, Philadelphia, and Seattle to learn more.